One of Mitt Romney's top Cuban-American backers in Florida told Yahoo News that the former Massachusetts governor made a mistake when he said that "self-deportation" was the solution to illegal immigration. "It was frankly a bad choice of words," Mario Diaz-Balart, a Republican representative from South Florida, said in an interview with Yahoo News. Diaz-Balart compared Romney's use of the phrase "self-deportation" to President Barack Obama's flub in 2008 when he said he had visited "57 states" on the campaign trail. "I don't think you can judge him on one phrase," Diaz-Balart said of Romney. That hasn't stopped Newt Gingrich from trying. Gingrich mocked the idea of "self deportation" as a fantasy in an interview Wednesday with Univision's Jorge Ramos. Romney defended his choice of words and his policy in his own interview with Ramos. Romney said the phrase "self deportation" means more strictly enforcing immigration laws until illegal immigrants are unable to find work and voluntarily leave the United States. "I'm not in favor of going across the country and rounding people up and putting them in buses," Romney said. In Florida, Romney is--for the first time in this presidential campaign--pitching his anti-illegal immigration policies to a significant chunk of Latino voters, which may offer a glimpse into how he could sell the message in a general election. Eleven percent of Florida's registered Republican voters are Hispanic, according to the Pew Hispanic Center. Among these voters, many of them Cuban-American, Romney enjoys a 15-point lead over his rival Gingrich, according to the latest Univision/Latino Decisions poll. Cubans who reach the United States are granted a path to citizenship under federal law, but most Hispanic Republican voters in the state still support measures like the Dream Act that give legal status to some people who are already living in the country illegally. Mario Diaz-Balart supports the Dream Act, as does Ileana Ros-Lehtinen, another Cuban-American member of Florida's congressional delegation who has endorsed Romney. According to the Univision poll, about 70 percent of Florida's Hispanic Republican voters support the Dream Act, compared to about 90 percent of all Hispanic voters nationwide. Romney publicly embraced a military-only version of the Dream Act during Monday's presidential debate in Tampa, only a month after he vowed to veto the Dream Act if it came to his desk as president. The Dream Act would grant legal status to some people who were brought to the United States as children and who go to college or join the military. "It's going to be like walking on eggshells," Susan MacManus, a political science professor at the University of South Florida, said of Romney's presidential campaign in Florida. 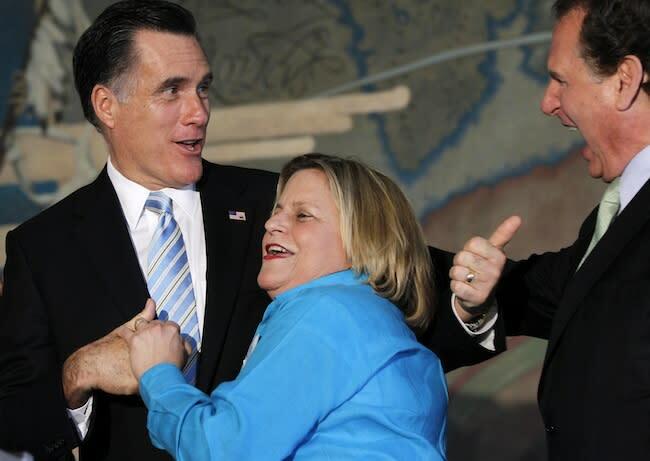 Diaz-Balart and Ros-Lehtinen have lined up behind Romney, even though they disavow his stance that no one residing illegally in the country should be eligible for legal status. Marco Rubio, another influential Cuban-American politician in the state, has said he will remain neutral in the race, though he recently came to Romney's defense after a Gingrich ad called him "anti-immigrant." "There's no secret that the governor and I disagree on immigration," Diaz-Balart told Yahoo News. "Governor Romney is a real hardliner on illegal immigration." Diaz-Balart said he thinks Hispanic voters in the state care more about Romney's economic positions and presumed electability than what he says about illegal immigration. "Immigration comes up, but the issue that is on everybody's mind is the economy," he said. In November, only 4 percent of Florida's Hispanic Republican voters supported Gingrich, but that number was at 20 percent in the Univision poll, which was conducted from Jan. 16 to Jan. 23. David Rivera, a freshman Cuban-American lawmaker who has endorsed Gingrich, told Yahoo News that he thinks Gingrich is the only candidate who has a shot at winning the Hispanic vote in the general election, when Romney's stricter immigration proposals may come back to haunt him. "He's the only candidate to have a humane and reasonable policy on immigration reform," Rivera, who is facing multiple criminal investigations over his time as a state lawmaker, said of Gingrich. He added that Gingrich's support among Hispanic Republicans in Florida is probably higher than the Univision poll indicates, because many people were surveyed before Gingrich's victory in South Carolina, which will presumably give the Speaker a boost. Rivera told Yahoo News he didn't understand Romney's illegal immigration position. "You could have had self-deportation now," he said. "Nobody's really gone back."